I interrupt my series “Healing the Divide” to bring you my thoughts on a book I just completed, as promised. It is the Franciscan monk Father Richard Rohr who I heard say in an interview that “A lot of times, one sees only what one is told to see”. 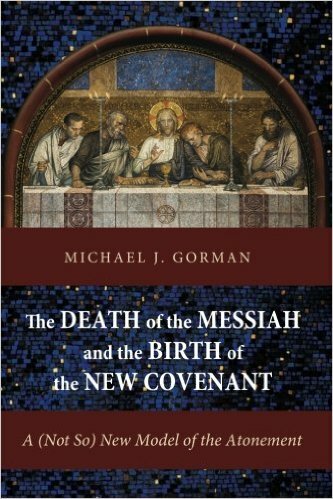 I came away from reading Michael J. Gorman’s 2014 publication “The Death of the Messiah and the Birth of the New Covenant: A (Not So) New Model of the Atonement” with the same feeling. How did I not see this before! Well, I didn’t see it because I wasn’t trained to see it. It was indeed hidden in plain view. I first heard of Michael J. Gorman when he interviewed NT Wright and Richard Hays together on the implications of Wright’s big book “Paul and the Faithfulness of God”. In that conversation, they referred back to Gorman’s own writings on the cross, and I made a mental note to read him sometime. However, I’d been thinking of the subject of atonement for quite a long time, and someone recommended him. To that someone (David Fitch), I say “may your tribe increase”. First, what do we mean by atonement, for the uninitiated? Atonement is a fancy word created from multiple words: “at-one-ment”. It describes how human beings become reconciled to God through the death and resurrection of Jesus Christ. However, there have been many ways (or models) of explaining how this “atonement” works – some of the models are Christus Victor, substitutionary atonement, moral example etc. And it seems each tradition of Christianity gravitates to one or the other, leading to disagreements. “All models of the atonement are necessarily selective, because the New Testament writers did not set out to write a theology of atonement, and certain perspectives and themes emerge in particular writers and writings more than in others”. Current models of atonement are isolationist. “Each one is constructed as a kind of stand-alone theory that supposedly tells the whole story and requires exclusion of other versions of the story” (Gorman, 2014). Drawing from the point above, current models are atomistic, not drawing from the richness of other models. The third problem is individualism. Most models of the atonement are focused “on the individual, rather than on both the individual AND the community”(Gorman, 2014, my emphasis). Each model under-achieves. On it’s own, each model does not do enough. He proposes a different starting point for understanding why Jesus died – by looking at Jesus’s own words at the Last Supper in the context of Israel’s own story of covenant in both Torah and the Prophets. It seems that though other scholars may have hinted (in bits and pieces) in the same direction, he might be the first who has written in full detail what he calls a “new-covenant” model of atonement. It is here that he blows my mind. Because he points out that, this should have been obvious, but has somehow been screened out of our conversations about why Jesus died, or has not been read in light of Old Testament history and context. At the Last Supper, the evangelists Luke and Matthew record Jesus using specific words when he shares the wine as his blood. Though Luke uses the word “new covenant” to describe the blood of Jesus, Matthew simply says “covenant”. But the implications are the same, if we look to Moses and the prophets. After Moses had received the Law from Yahweh (Ex 19-23), he (Yahweh) instructed him to call the elders of the people together, read it out to them and perform a ceremony. In Exodus 24, Moses does as Yahweh instructed, reading the Law to these leaders and asking them to express their agreement to do as Yahweh has instructed, which they agreed to (“they all responded, ‘Everything the Lord has said we will do’” – v 3). Moses then sacrifices young bulls on an alter made from “twelve stone pillars representing the twelve tribes of Israel”(v 4). He then took the blood of the bulls, sprinkled it on the people and said the magic words “This is the blood of the covenant that the Lord has made with you in accordance with all these words” (v 8). Obviously, the blood was meant to seal the covenant between Yahweh and his nation Israel. The observant reader will realize that these are more or less the same words that Jesus used at the Last Supper. But why does Luke say “new covenant” and why does Matthew say “for the forgiveness of sins of many”? Here, Gorman points out that as the prophets had attributed the exile from the land to Israel’s sinful unfaithfulness to the covenant with Yahweh, the prophets again had promised that Yahweh will enact a new covenant with his people, a process which will involve him cleansing them of their former disobedience. This is best captured by the prophet Jeremiah. Gorman could have ended the book here, and I’d have been convinced, but he goes on further to clarify in what way this new covenant was different from the old one. He draws out the ways in which this new covenant will be “new”, because that is precisely the word that prophets like Jeremiah used to describe it. This covenant is enacted in and through Jesus’s self-sacrificial actions on the cross. In effect, God himself, through Jesus, sheds his blood to seal this covenant. Drawing on the Eastern Orthodox theology of “theosis”, Gorman traces all over the Gospels, Paul’s letters and the book of Hebrew how the new-covenant people are not just called to be beneficiaries of this self-sacrificial action, but to participate in it as God’s means of redemption of the world, and as a means of taking on the divine nature. Hence Paul’s statements like “I want to know Christ—yes, to know the power of his resurrection and participation in his sufferings, becoming like him in his death,” (Phil 3:10). In line with point 2 above, he draws on Phil 2:5-11, point out that Jesus’s willingness to be made nothing, “taking the very nature of a servant”, shows an attitude that this new-covenant people must adopt. Its an attitude not to “lord it over”, but to serve, even one’s enemies. Indeed this new-covenant people become a people of non-violent, non-coercive, self-sacrificial love. This new-covenant is also marked by a widening of the gates for non-Jews to be participants, unlike the previous covenant that was limited to Jews only. This is also part of the prophetic expectations being fulfilled. Lastly, this new-covenant will be marked by the empowerment of the Holy Spirit, to bind together the new multi-cultural, multi-ethnic new-covenant people of God in their ability to live self-sacrificially, non-coercively and non-violently at peace with each other, and at peace with a world in which violence still reigns, until the consummation of the kingdom yet to come. As he puts it, “Life in this new covenant is life in the Spirit of the resurrected Lord that is shaped by the faithful, loving, peacemaking (and therefore hope-making) death of the same crucified Jesus” (Gorman, 2014). And so he wraps up by restating clearly his proposal for understanding the death of Jesus Christ. He goes on to the express how a new-covenant model of atonement makes sense of all the previous theories of why Jesus died, and yet overcomes all the deficiencies that one sees if one tries to hold only one of them up as the “correct” theory. In this effort then, Gorman has indeed established a way forward beyond the atonement wars, a way forward that was so obvious and yet has been missed for centuries. If taken seriously, it overcomes a lot of the earlier complaints he began with about holding one of the standard ones against the other – complaints of isolationism, individualism and underachievement. In light of this great book, Michael J. Gorman is now very welcome on my Amazon wishlist. I believe after my personal readings of Richard Hays (whose beloved book “Moral Vision of the New Testament” was referenced quite a bit by Gorman), his 3 part series on cruciformity should be next. It’s not everyday that one finds a United Methodist who describes himself as an Anabaptist-Wesleyan, and yet expounds Eastern Orthodox theology whiles holding a chair in New Testament at a Roman Catholic Seminary, itself a rare feat. These are divisive days, and the church needs courageous theologians like Gorman, who are not willing to let themselves be confined to the boxes of their own traditions, but are willing to seek truth where it may be found. In this respect, Gorman is indeed a gem. Seeing as I’m not getting any younger (try as I might), I’ve been reflecting on the last 10 years of my Christian walk, and wondering what books I will recommend to a younger Christian from my library. So I thought to write down the top 10 books of the last decade of my life. 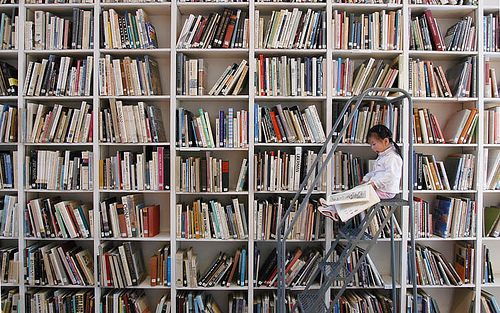 Note that they are in order of when I read them, not necessarily which one is the best, a judgment that I cannot make. This was the book that first answered some of the doubts my church family and I already had about today’s church practices. It details how modern Christianity’s idolatrous fixation with church buildings, the history and legitimacy or otherwise of tithing for Christians, the clergy/laity divide, sermons and their origin etc. have more to do with Greco-Roman paganism than 1st century Christianity. Not safe for those who like church as it is today. This one unfolds God’s plan for his church which he laid out before the foundations of the earth. It discusses several images that the New Testament writers use to describe the church, including the bride, the house, the family, the temple etc. It challenges your comfort zone on why churches exist in the first place. A classic on the Protestant Reformation of the 16th century, and how those who wanted to take things further than the leaders of the Reformation would allow were hunted down, tortured and killed in all sorts of macabre ways. The beliefs that these Anabaptists aka the Radical Reformation, suffered for seem self evident now, and a lot of Christians now hold to most of them, and yet very few acknowledge those who actually died to state that these practices needed to change. Popular Christianity has a lot to learn from those who chose such narrow paths to their own detriment. Having read about Anabaptism, it seemed only logical that the next book be one by an Anabaptist himself. This book caused a revolution in Christian by questioning how Christianity had come to view Jesus as not caring much about the socio-political environment in which he lived, by virtue of which Christians have left social and economic justice to be the purview of the “world leaders”, when in fact Jesus tasks the church to be very busy following him in this direction of being “good news” to the poor, oppressed, sick, marginalized and downtrodden. Whether Christians who were ruffled by what he said decided to take Jesus seriously or go back to the apolitical Jesus really becomes a conscious choice. My first introduction to the world of New Testament history. FF Bruce really peaked my interest in understanding the world of the 1st Century and using that as an additional tool in understanding Jesus and early Christianity. Bruce, thanks for setting me on the right path. Ben Witherington takes a good look at the meal with many names i.e. the Lord’s Supper, Communion, Eucharist etc. He sketches out how it has been observed historically from the times of early Christianity where it was a full meal sometimes taken even before the meeting began, to the Roman Catholic and Protestant interpretations of it and how it’s observed today. He encourages us to look again at how pivotal this meal is, and yet to remove the cruft that has put so much superstition around it. A good read. Why do we have many interpretations of the same bible by different people who claim to follow the same Jesus? Could it be that the attitudes with which we come to the bible are the problem, and not the bible itself? In the light of the million and 1 divisions in Protestant Christianity, should we reconsider the notion that “a simple plain reading of the bible with the Holy Spirit’s guidance” is all we need to correctly interpret the bible? Christian Smith provides a more satisfying, balanced and humble approach to how we should approach the bible, making Jesus the centerpiece for biblical interpretation. This close to 700 page masterpiece on Jesus really expanded my reading of the gospels beyond the nice, safe, simplistic stories that I had been taught in Sunday school. Laying down the background of 1st century Judaism from “New Testament and the People of God“, NT Wright lays out Jesus’s ministry by mainly seeing him as a prophet like Jeremiah, Isaiah etc. No, the parable of the prodigal son meant more than you think, the cursing of the fig tree was a proper condemnation of Israel, the cleansing of the temple was a very prophetic activity. And by the way Mk 13 and Matt 24 are not talking about some “End Times” with some great tribulation as depicted to us by the Dispensationalists – they referred to concrete actions which happened in AD 67-70. For those who don’t have the time, reading “How God Became King” by the same author will suffice, since it’s a smaller, less academic one. The 3rd in the “Christian Origins and the Question of God” series, this does a detailed survey of what resurrection meant to the cultures that surrounded 1st century Jews i.e. Greek platonism, and clearly differentiates it from resurrection as understood by Jesus and his disciples before it even happened to Jesus. I was expecting to get the arguments for why Jesus’s resurrection was historically plausible which this book has in spades (including debunking all the claims of similarity with other “resurrection myths”) but the additional content laying out the implications of Jesus’s resurrection for Christianity itself was the part I enjoyed the most. For those who don’t have the time, reading “Surprised by Hope” by the same author will suffice, since it’s a smaller, less academic one. Over the centuries, the good news of Jesus has been reduced to many statements, but today almost universally the refrain is that the gospel is that “Jesus came to die for our sins”. Scott McKnight draws the difference between this the “soterian gospel” or “plan of salvation” and the gospel according to the New Testament. He expands our view of what the word means from a historical analysis of the word “evangelion” and its usage in the 1st century to an analysis of 1 Cor 15:1-11, and places the emphasis where it should be – on the declaration of Jesus as God’s anointed king who is calling people into his kingdom now and kingdom future. Others interesting books that didn’t make the list include Howard Snyder’s “Salvation Means Creation Healed” , Dallas Willard’s “Divine Conspiracy”, Greg Boyd’s “The Myth of a Christian Religion” (which I still haven’t finished fully but loved anyway and will reread all over someday). And sorry, I don’t read “motivational” books. I simply don’t have the stomach for their fluffy feel-goodness.